Enlarge / The McLaren Senna, the cover car for “Forza Horizon 4,” is unveiled at the Mixer booth at E3 2018 on Tuesday, June 12, 2018 in Los Angeles. 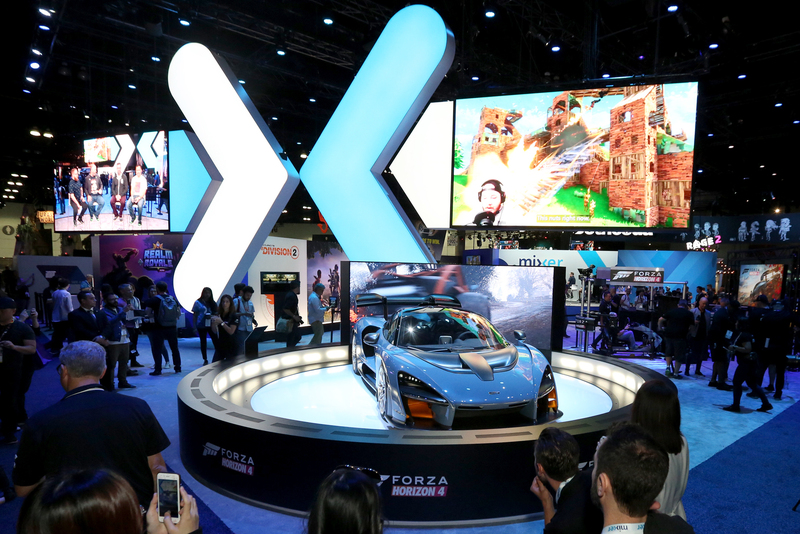 LOS ANGELES—Microsoft’s presence at this month’s E3 had its share of Xbox surprises, but a new annual Forza racing installment wasn’t one of them. Forza Horizon 4, with its off-road London setting, had already leaked ahead of the official mid-June announcement, and we didn’t learn many more surprises during a behind-closed-doors meeting with the game’s developers at Playground Games. One exception, however, got lost during the E3 hubbub: a blink-and-you’ll-miss-it confirmation of a first in the booming world of game streaming. It’s a subtle thing, which we’re dubbing “stream-to-win,” and it sees Microsoft take its boldest step in battling the behemoth service Twitch. Custom car paint jobs and car-tuning loadouts are not new to Forza franchise, but that last option is. Horizon 4 will be the first Microsoft Studios game to recognize when players broadcast their live gameplay via Mixer and then give out bonuses within that game for doing so (Mixer is a Twitch-like service that Microsoft acquired in 2016 before re-dubbing it Beam). All Xbox One consoles received an update last year to integrate one-button “stream to Mixer” support, which players can swap to Twitch by going through the system’s options. Penrose did not elaborate on how much “progress” can be unlocked for turning on a Mixer broadcast, nor did he elaborate on whether players can earn rewards for doing the same thing on Twitch. (If Playground and Microsoft Studios lock Twitch out of this perk, they may be pushing their luck.) Microsoft has yet to announce whether Horizon 4 will include other new ways to earn (or pay for) in-game bonuses. In the week-plus since learning this about Horizon 4, we have been unable to find a comparable feature in any video game—meaning, one that recognizes a broadcast (on Mixer, Twitch, or any other service) and then gives out goodies inside the same video game as a reward. Some video games already include official and deep integration with Twitch and Mixer, but these rely largely on audience-driven votes, like in the digital card game Superfight and the battle royale game Darwin Project. No other Microsoft Studios game at E3 received a similar stream-to-win announcement. Throughout E3, Playground Games beat the drum about how playing Horizon 4 online will provide a way to “live the Horizon life,” and this Mixer functionality ties into that sales pitch. Penrose insisted that online players will have their racing worlds populated entirely by real-life online racers, though a demo video confirmed that those online peers will not be able to slam into or otherwise grief your own car unless they are invited to your own party. This means the default Horizon 4 experience may include a lot of driving-through-ghosts encounters, which runs counter to the game’s “reward for risky driving” system when players pull off successful near-misses. Additionally, Penrose confirmed that the game will 100-percent work offline, with zero required logins to a Microsoft or Playground server to start or advance in the game. Playing this way will populate your roads with AI-driven cars, which you can smash into. He insisted, however, that “you can’t engineer the fun of a human player into an AI system,” which is a curious proclamation for a series that has long bragged about how clever its AI-powered “Drivatar” racers are. Whether you play online or offline, major events in the game will unlock every week (as defined either by an online clock or your local system clock) with an official, full-world change of the game’s seasons. Similarly, that means certain areas of the game will only be available in a given real-world week, since the game’s shift from frosty winters to sunny summers will lock and unlock various parts of the full game map.